Siliguri is a district in Darjeeling, West Bengal. This place is the ideal location for those who have come on a family trip and for those who are on a business trip. The city is located in the foothills of Himalayas and on banks of Mahananda River, which makes this place geographically beautiful are magnificent. The city has also been on growth since the year 2009, and has become the main trading centre of North Bengal as there are migrants from other states who have the potential to work. In order to make your stay elegant and comfortable hotel Sarovar Premiere offers you exactly what you need for a perfect stay. The hotel is massive and built on an area of sixty five acres. 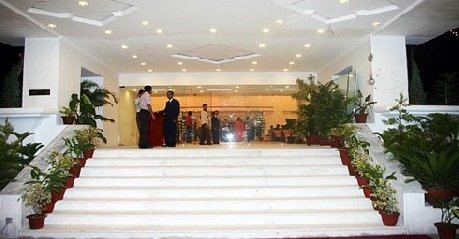 The aura of the hotel is positive and is away from the hustle bustle of the city. Located about fifteenkilometers away from the airport and half an hour drive from the main railway station is easy to reach and centrally located. In addition to facilities like room service, car rental, laundry services, business centre, fax facility, in house spa, mini bar, doctor on call, travel desk facility and room dining, they offer beautiful landscape and luxurious rooms. The rooms are built on an area of 216 sq ft. The flooring is wooden and so is the furnishing of the room. The beds in the room are twin and separated by a small and chic peg table. The walls have pastel shades with abstract paintings in contrast colors put up on the wall behind the bed. The room also has an attached washroom which has modern bath fittings and basic amenities. This room is complete value for money as everything you need is present in the room. The room also offers a view of the hotel’s huge swimming pool or the city view which is simply breathtaking both at dawn and at dusk. The room is equipped with TV flat screen, Tea and coffee maker, luggage storage, to couches and a small centre table. The rooms are built on a spacious area of 305 sq ft. the rooms are spacious as compare to the deluxe room. 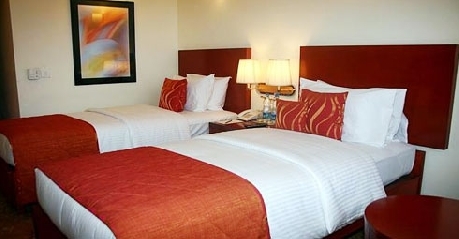 A queen sized bed has been offered in the room with plush upholstery and soft mattress. The room has an attached washroom that is elegantly crafted to add luxury to your stay. There are two peg tables at either side of the bed. Lighting of the room is authentic and contemporary. The room has all the basic facilities like room service, in-room dining, TV screen with satellite connection that offers your favorite channels and tea/coffee maker. The room has wooden flooring that adds to the warmth in the room. This room has been especially crafted for you so that you can enjoy the luxury at its best in a beautiful city. The room cover the floor area of 448 sq ft. Suite offers the exhilarating view of the Himalayas and of swimming pool of the hotel. The best part of the suite is the spacious living room that has a large sofa set with modish and state of the art interiors. The colors of the living room contrast with that of the bedroom adding liveliness to the room. The flooring is all wooden; the room has an easy chair with a small work desk. The washroom attached to the suite is spacious and has modern bath fitting and posh accessories. This is a multi cuisine restaurant known for its better-than-perfect ambience and mouth watering food. The menu of the restaurant offers more than hundred dishes ranging from cuisines from all over the world. The restaurant is also known for the all day buffet service that delights with more than fifty dishes and desserts. There are special menus for the midnight wherein you can enjoy the glitters of the night with healthy and delicious food. The restaurant has elegant chairs and tables placed in cluster type seating arrangement. The flooring is granite and has beautiful lighting system. This restaurant is special in its own terms. The ethnicity of the north east India has been kept alive in this restaurant. The restaurant specializes in Thai and Chinese cuisine that not only has unique taste but is healthy as well. The restaurant is located at a location where you can enjoy the beauty of Himalayas and the city lights. The flavors that they offer are unique and enrich your taste buds. It is a large restaurant which can house more than seventy five families simultaneously. Dedicated and personal assistance is offered to the customers so that they can enjoy the best dish. This is an exotic bar that offers you the best mock tails, cocktails and other hard drinks. The place is ideal for those who want to relax and enjoy the beauty sip by sip. The bar can accommodate over forty guests together. The place can also be used to throw parties. The place is also ideal for get together. The bar also offers delicious snacks that match perfectly with the crisp drinks. The main attraction of this bar is the music that is played. Depending on the time of the day the music is played accordingly. The ambience is refreshing and different in its own way. This is a light and easy lounge where you can sit back, chit chat with your friends, discuss the business deals and do other exciting stuff. The bar houses soft and healthy bakery items like patisserie, confectionery, concoctions and savories. The lounge also has refreshing drinks that will help you sooth your senses. The light music adds to the tranquility of the lounge. They not only offer tea but other light beverages are also available. All this comes with an exquisite and panoramic view of Siliguri and the Himalayas which look breathtaking during dusk and so exhilarating is the aura of the lounge itself.